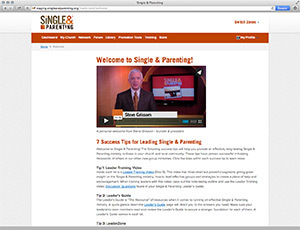 The Single & Parenting LeaderZone is an online resource center for “leaders/church staff only,” providing free, ongoing support and the latest Single & Parenting news to make your church’s group more effective. At this password-protected website, your leadership team members will find articles, publicity tools, resources, news, training opportunities, downloadable forms and a daily moderated forum to communicate with other leaders. Embed promo videos on your church website, or email to single parents and community organizations. Purchase additional workbooks, brochures, posters and audio sets. Download articles, forms, certificates and handouts for running your group, including the 13 session agendas. List your church’s group in the Find a Group searchable database, viewed by thousands. Order a banner to place outside your church. Connect with other Single & Parenting churches in your region. Share questions, tips and experiences on the Leaders’ Forum.